As a publication covering this movement, we’ve been waiting right alongside them. Waging Nonviolence began its Keystone XL coverage with a blog post in August 2011, asking, “Can two weeks of mass action in DC stop the tar sands pipeline?” It was an honest question, harboring some (now laughable, in hindsight) doubts that the police would play their part in the planned acts of civil disobedience. Days later, however, we found out first-hand just how serious this wave of resistance was going to become, as two of our editors got arrested on the first day of what would become an historic two weeks of sit-ins outside the White House. Nevertheless, today’s announcement doesn’t provide a clear answer to the question posed in that very first blog post. On the one hand, the answer is “no.” Those two weeks did not stop the pipeline — not on their own. After all, it’s taken over four years to reach today’s decision. On the other hand, those two weeks sparked or shined light upon everything else that did (cumulatively) stop the pipeline — from the First Nations resistance that came before it to the ongoing frontline community struggles against all forms of extreme energy to the moments when everyone came together (like with last year’s People’s Climate March) to show the true size and force of this movement for the planet and it’s people. For a site like Waging Nonviolence, which seeks to show the inner workings of movements and how they build power, today’s victory is more than an opportunity to celebrate, it’s an opportunity to reflect upon the work that changes our world. So, we invite you to do that. 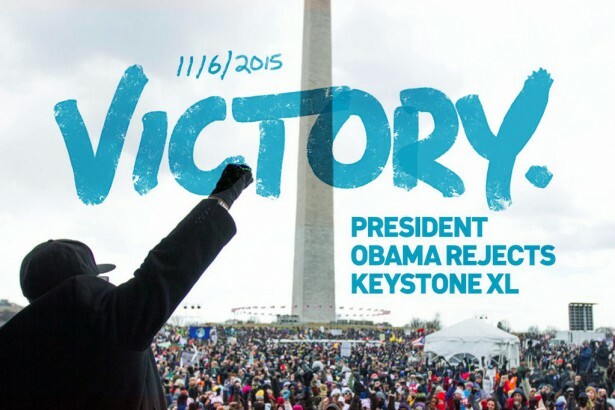 You can view all our Keystone XL resistance coverage here — at the Sans Tar Sands series page. Or, for a curated list of our favorite pieces just keep reading. The more we understand how to succeed, the more opportunities there will be for celebration. “We don’t know how many people it takes to encircle the White House, but we’re about to find out,” Bill McKibben told a crowd of over 12,000. It ended up taking far less, as the lines forming the circle were four deep. One year after more than 1,200 people were arrested in front of the White House protesting the Keystone XL tar sands oil pipeline, a coalition of Texas landowners and activists will attempt to physically halt its construction. A new front against tar sands mining has opened and this time it’s not in Canada, but in Utah. Tar Sands Blockaders and anarchist community organizers have been cultivating a growing resistance campaign in the Houston neighborhood of Manchester. The nation’s largest and oldest environmental organization follows up on its pledge to engage in civil disobedience for the first time in its 120-year history. Climate justice needs radical demands and backed up with mass nonviolent direct action. The question, though, is: How do we get to that point? One native prophecy speaks of a black snake that — much like the Keystone XL — will bring great destruction. Another speaks of different peoples uniting to defend the land. Now, it too is becoming a reality, thanks to indigenous-led organizing.